Build the keyboard setup of your dreams. We combined all of the essential features you could want in a keyboard tray and mouse platform with the Humanscale 900 Standard Keyboard Tray, keeping you typing and your hands in the correct, ergonomic position. 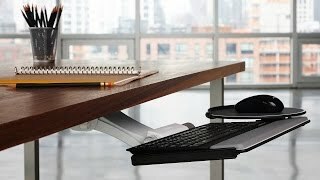 Designed to fit on most desks and hold most keyboards, you'll have the unique ability to tilt the tray to that working sweet spot that your hands, wrists, and arms appreciate, leading you to better work. Swivel and adjust to your ideal height for the best in ergonomic support, all at your fingertips. The keyboard tray is one of a collection of crucial desk accessories to keep you working comfortably, with hypoallergenic palm supports that take the pressure off your wrists while typing. Customize your keyboard tray to support your body and work style. The Humanscale 900 Standard Keyboard Tray design ensures that users type and mouse within their Neutral Reach Zone, creating a safe, sustainable, and supremely comfortable work environment. The Humanscale 900 Standard Keyboard Tray is available in black, white, or platinum. Both the keyboard mechanism, keyboard platform and mouse platform will come in the chosen color. The clip mouse platform is the only mouse platform that allows the user total adjustment control in all three dimensions - height, depth, forward/back and tilt, allowing it to be adjusted precisely the way you need it. It also easily snaps onto either side of the tray for left or right use, and it's available in two sizes and different height ranges. The Humanscale 900 Keyboard Tray can be ordered with a mouse pad to match any of the available mousing platforms. Select from four different palm rest options for your 900 keyboard tray: All are covered with an easy to clean, black synthetic leather and are 19 inches long. The 19 inch slim gel palm rest with synthetic leather cover is only about a quarter of an inch thick and is available in black or silver. Slim palm rests are not compatible with swivel mouse platforms. When designing your Humanscale 900 Standard Keyboard Tray, if you choose to not add a palm support, there will be two holes located at the installation points on the tray. I added the side to side adjustable platform for the keyboard. This makes it easier to get the keyboard centered on you monitor and still have the pop up mouse tray clear your desk. I didn't need the keyboard tray pad, as my keyboard came with a pad. If you can't get this adjusted to where you want it, you haven't played with it enough. This is the best keyboard tray I've ever used. Very stable, very easy to use, great price, great value compared to what else is out there. We often work extremely long hours, up to 18 hours a day, sitting at our desks. This keyboard tray helps tremendously with posture and comfort. I did a lot of research to find the right keyboard tray for my office, and this one really stood out because of that adjustable clip mouse platform and 5g mechanism that adjusts quickly and tells you the degree of tilt also. I have arthritis in my fingers and can't mess with adjustments much, so I called to confirm that this would work for me. Brian walked me through my configuration- the most popular 5G90090HG and really took the time to determine exactly what I was looking for in a setup. (If you aren't sure what you need, I highly suggest calling these guys to get their advice.) Anyways, the lead time was a little long but nothing major- two weeks, and they kept me in the loop during this time too. It arrived, was easy to install (15 mins), and is very well built. It's completely changing the way I work and sit, so I'm really pleased with how everything worked out. This keyboard tray just works. I like the adjustments and the features. I got the high clip mouse with the 5g mechanism. $229.00 List Price: $390.00* The list price is the same as the MSRP (Manufacturer's Suggested Retail Price). It may not necessarily be the price at which the product is sold.